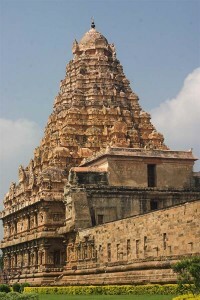 Gangaikonda Cholapuram is situated 48 km from Chidambaram. Gangaikonda Cholapuram and the palace have been built between 1023 and 1029 A.D. and around Gangaikonda Cholapuram one can visit places of interest and tourists attractions and landmarks of religion and new surge of creativity of the 10th and 11th century. Gangaikonda Cholapuram may look today of a tiny village but its glory and grandeur vividly come to the visitor’s mind when he looks at the majestic temple, the frail wall, mounds of sand heats. The city was carefully planned and built with high wall. The palace has many stories. The lofty Srivimana of the temple lifts its stately head as if scanning the vast arena of the Bygone Empire. The temple dedicated to Lord Shiva, built in brick and motar is unique. The name of the deity in the sanctum is Pariaudayar. The Lingam is 60 ft. high, the stone above the base is sixteen and half feet long and thirteen and half feet wide. Another speciality in construction of this temple is that the rays of the sun always fall in the sanctum even though the entrance is facing the east. It is a marvel of the construction. The temple tower is gracious with all feminine elegance and charm as the tower bends a little. The unique feature of the temple is delectable set of sculptures found on the garbagraha walls numbering as many as 50. They are boldly conceived and executed. It is a wonder that the bronzes of the temple survived nearly a thousand years. The metal images of Shiva and Uma, forming perhaps the biggest set among such icons of the Cholas are of outstanding beauty and grandeur. This entry was posted in Gangoikonda, Tamil Nadu. Bookmark the permalink.